SVT Associates offers a wide selection of Effusion Cells to evaporate almost any elemental or compound material. Each Effusion Cell is manufactured from high purity materials with all ceramic and refractory metal hot zones. This ensures no undesired outgassing in a UHV environment as well as the longevity of the cells. 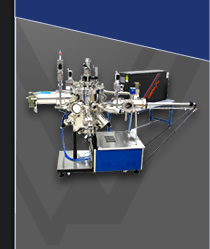 The Effusion Cell is a highly controllable and efficient deposition source for MBE and non-epitaxial Physical Vapor Deposition. The radiatively heated crucible with a close coupled thermocouple ensures stability and reproducibility not found with other evaporation sources. The optimally shaped crucible increases material utilization.